ATLANTA (AP) — Following an ugly loss to Clemson on Sept. 22, Georgia Tech was 1-3 with three straight losses and appeared bound for a second straight losing season. “The sky was falling after that game,” coach Paul Johnson recalled on Tuesday. Somehow, Georgia Tech’s season never hit bottom. Since the 49-21 loss to No. 2 Clemson , the Yellow Jackets (7-4) have enjoyed a dramatic turnaround, winning six of seven. They will take a four-game winning streak into Saturday’s game at No. 5 Georgia. Running back Clinton Lynch said the winning streak has the Yellow Jackets “playing with pretty good confidence” at a good time. “You always need that confidence to go up to Athens and get the W,” Lynch said. If Georgia Tech could pull off its third straight win in Athens, a season already revived would become special. Johnson said his players ignored doomsday predictions and kept their focus following the 1-3 start. Johnson said there was panic outside the program because the loss to Clemson revealed the Yellow Jackets could not compete with the Atlantic Coast Conference’s top team . Georgia Tech finished 5-3 in the ACC, behind only Pittsburgh in the Coastal Division. After the Clemson game, Georgia Tech’s only other loss was against Duke. “I think toward the last half of the year these kids have done a really good job of just trying to focus on what they can control,” Johnson said. 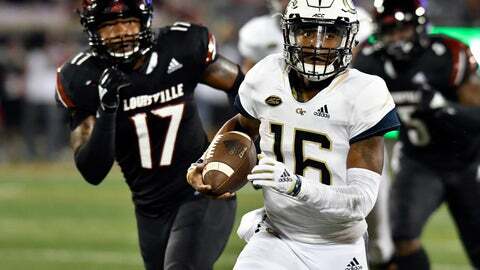 Georgia Tech’s recovery has come with senior quarterback TaQuon Marshall’s improved health. An undisclosed injury forced Marshall to miss a 49-28 win at Virginia Tech on Oct. 25. Marshall reclaimed the starting job from Tobias Oliver and ran for 107 yards in last week’s 30-27 overtime win over Virginia . As always, ball security is crucial in Johnson’s spread-option offense. Marshall has been accurate with his option pitches and has made good decisions on when to keep the ball. “He’s taken care of the ball,” Johnson said, rapping his knuckles on the table in front of him for good luck. Marshall is the only quarterback in Georgia Tech history to run for at least 100 yards in 10 career games. He leads the Yellow Jackets with 857 yards rushing and is second with 11 touchdown runs. Georgia shut down Marshall and the option attack last season, holding the Yellow Jackets to 188 yards rushing in a 38-7 win. Marshall noted this year’s Bulldogs defense lost some of its top players, including first-round draft pick Roquan Smith, to the NFL.